Nothing is more important than a color-coordinated morning. Rushing out the door in clashing colors is a sure way to upset the balance of the day. Mornings can be tricky things, and tripping over an eyesore of a breakfast is an easy way to start the day off on the wrong foot. Luckily, there is a solution. 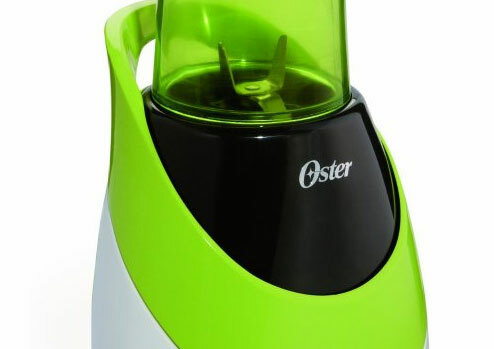 The Oster BLSTPB-WOR My Blend 250-Watt Personal Blender comes in four distinctive colors, sure to brighten your day. Available in Orange , Pink , Green or Blue , the blenders allow for blending directly in the plastic to-go bottle. Pop the blade off, snap on the cap and you’re good to go—even if it is Dress Up In Neon Day at work. * Blend your favorite smoothie or shake right in the sport bottle and go and enjoy it being stylish enough to carry with you throughout the day to stay hydrated; Carry hook on the lid makes it easy! Get up. Get blending. Get going. Your life on the go just took a whole new direction. Introducing the Oster My Blend, a strikingly stylish addition to the Oster family of blenders designed for your active, fast-paced lifestyle. Sleek, industrial design of the stylish travel sport bottle. It’s available in orange, pink, green and blue. The 20 ounce BPA-free plastic Sport Bottle comes complete with a carry hook and lid storage when put away. Works with the Oster My Blend blender, and looks are just the beginning. A powerful 250-watt motor turns ice and frozen fruit into your favorite smoothies, health shakes, and diet drinks. When in use, you replace the blade with the drinking lid, so you don’t have to drink with the blade still in the bottom. The Blender base is small enough to keep on your counter every day. Simply FILL the My Blend Sport Bottle, BLEND, and GO! REUSE throughout the day to stay hydrated with water and other beverages. The Oster My Blend. Smoothie skills that impress. Intriguing design that travels.